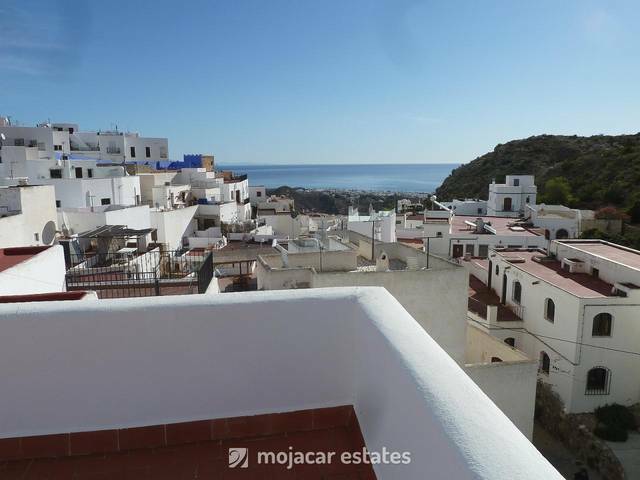 Choice of brand new 2 bed / 1 bath ground floor apartment with private terrace with sea and mountain views right in the heart of the charming and picturesque Mojacar Pueblo with sea and mountain views. a. Total built area: 72,52. Apartment with 59.51mts2 distributed between, living / dining room, kitchen, 2 bedrooms and and a family bathroom; Terrace of the living room with 3.00 mts2; Store room with 10.01 mts2. b. Total built area: 75.35. Apartment with 61.76 mts2 distributed between, living / dining room, kitchen, 2 bedrooms and and a family bathroom; Terrace of the living room with 3.50 mts2; Store room with 10.09 mts2. The apartment offers pre-installation for air condition and the comes with kitchen but not white goods. The building offers a massive communal roof terrace with 360 degree views. Please note that this is a first transmission and as such it will attract VAT at 10% and stamp duty at a reduced rate of 1.5%. Other purchasing costs are Notary and Land Registry Office fees as well as the purchaser’s own legal fees.